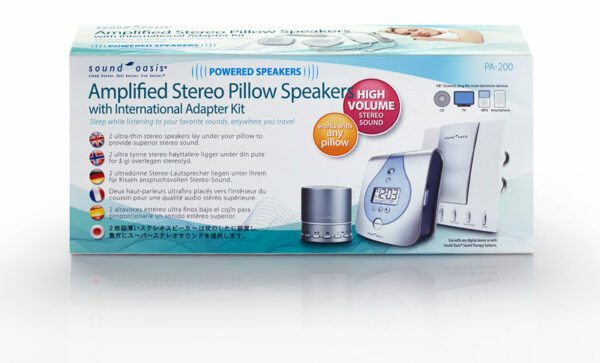 Sleep while listening to your favorite sounds anywhere in the world! 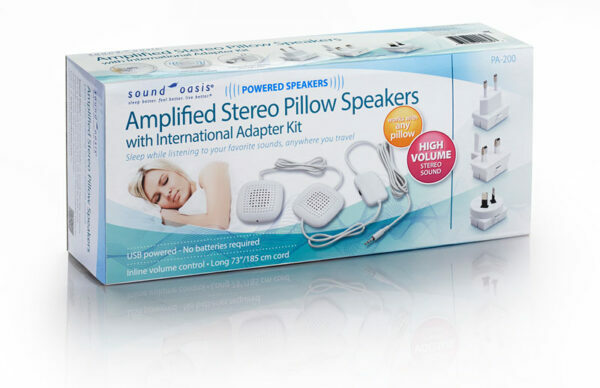 Amplified stereo pillow speakers allows users to enjoy their favorite music or sounds in optimal relaxation and comfort. 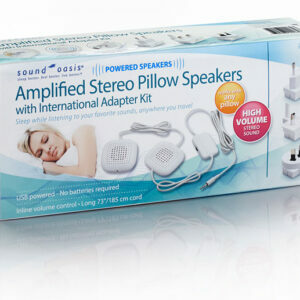 Sleep while listening to your favorite sounds anywhere in the world! 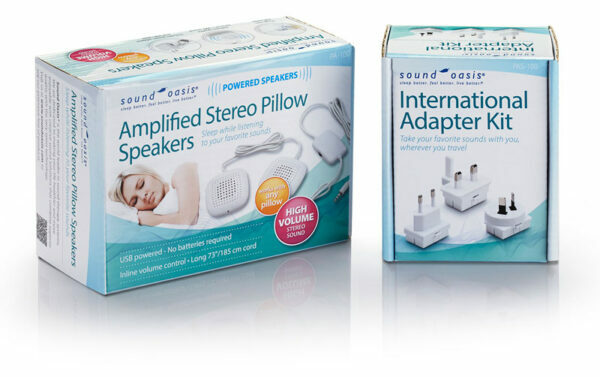 Sound Oasis Amplified Stereo Pillow Speakers allow you to enjoy your favorite music or sounds in optimal relaxation and comfort. 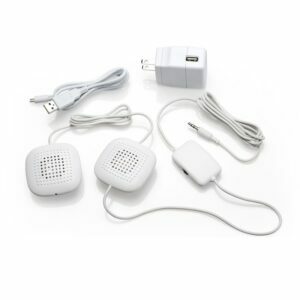 With built-in amplification and two high fidelity, ultra-thin stereo speakers, the high volume sound output is perfect for surrounding one’s head with music and sound for enhanced therapy or privacy. 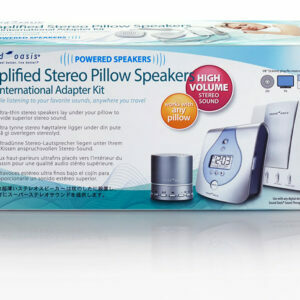 Ideal for help with sleep or managing tinnitus. 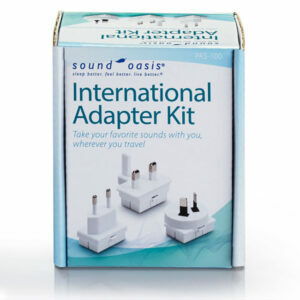 Includes global adapter set that works in any country worldwide. 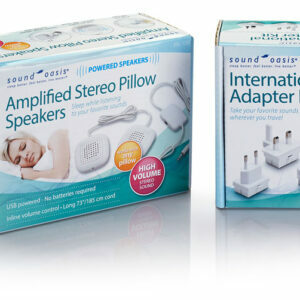 Two ultra-thin amplified stereo speakers fit under your pillow. In-line volume control for effortless volume control. 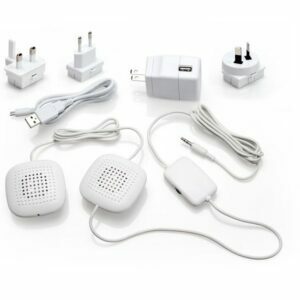 USB powered, includes USB cable and global power adapter kit for worldwide use. 1/8" (3.5 mm) plug fits most electronic machines including Sound Oasis® Sound Therapy Machines, tablets, MP3 players, CD players, TVs, etc. Works with any type or size of pillow. 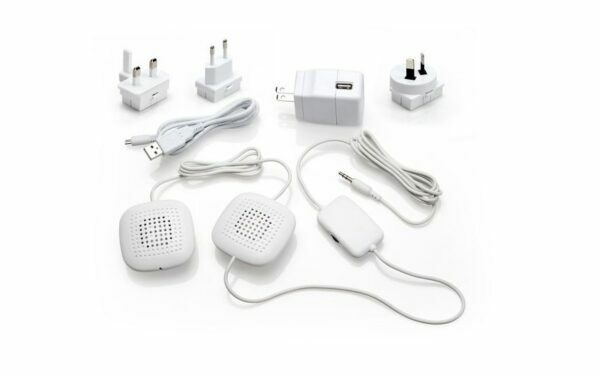 Includes international adapter kit with US, European, UK and Australian adapter prongs.